VietNamNet Bridge - Scientists say that problems in river basin management, due to a lack of cooperation among agencies, are threatening the country's water security. A high-level roundtable dialogue on integrated management of the Vu Gia – Thu Bon river basin and Da Nang – Quang Nam coast took place in late November 2016. 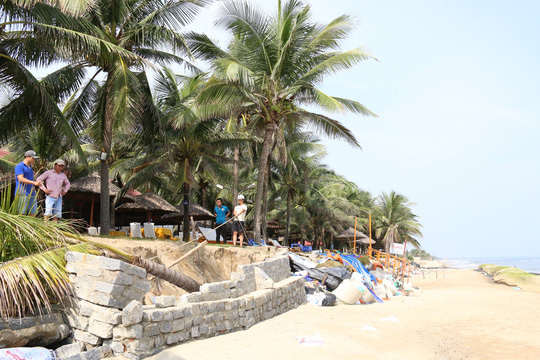 After years of discussions and negotiations, Da Nang and Quang Nam Province have signed an agreement on integrated management of the basin and coastline. Minister of Natural Resources and the Environment Tran Hong Ha in late November released a decision on the establishment of the steering committee on strengthening capacity for environmental management of water basins in an effort to improve river water quality which has become polluted, especially the Cau, Nhue-Day and Dong Nai rivers. The events show Vietnam’s strong determination to improve river basin management amid the warning that mismanagement is a big threat to water security. According to Nguyen Chu Hoi from the Hanoi University of Natural Sciences, river basin and coastal areas are two natural systems which have close relations in space and play a very important role in water resources and other kinds of resources, essential for human life and national development. Scientists say that problems in river basin management, due to a lack of cooperation among agencies, are threatening the country's water security. Meanwhile, with traditional management, which lacks cooperation among branches and provinces, river basins and coastal areas are in danger of unsustainable development. The challenges in water security, environment, ecology and livelihoods of local residents living in river basins, coastal areas and islands are getting more serious. The conflicts of interest and space in activities that use river basins and coastal areas for economic development are escalating. As for Vu Gia – Thu Bon river basin, Hoi said economic development activities and the unreasonable approach in water resource management will hinder the development of both Da Nang City and Quang Nam province in the future. Le Tri Thanh, deputy chair of the Quang Nam provincial authorities, admitted the big problems in the management over the river basin, saying that deforestation and placer mining are the factors that have had a big impact on the environment and ecosystems. The Ministry of Natural Resources and the Environment (MONRE) many times warned that Vietnam may become a country with thirst for water with underground water degrading, surface water getting seriously polluted and 90 percent of domestic waste water discharged directly to the environment. MONRE’s Deputy Minister Nguyen Thi Phuong Hoa said water security is a major challenge for the socio-economic development of the country. The endogenous water volume per capita in Vietnam is 3,400 cubic meters per annum. Meanwhile, according to the International Water Resources Association, a country is considered as lacking water if the figure is below 4,000 cubic meters.